Sniff...sniff... Can you smell it? The smell of summer? If you are anywhere near The Little Pink House you can since vinegar is the smell of summer 'round here. 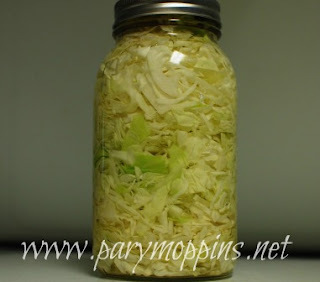 I have made 6 quarts, 1 pint, and 1 half pint of sauerkraut, a jar of pepper sacue, and 7 pints of Maw-Maw's Sweet Pickles. I've got a crockpot of yogurt doing its thing and a pot of pepperoncini peppers brining right now. I've just pulled a pan of Mrs. Wilma's Muffins out of the oven and will have dill pickles and something with cherry tomatoes going by the end of the day. Any suggestions on what to do with the tomatoes? *UPDATE* I ended up with 5 quarts and 4 pints of dill pickles and 1 pint of pepperoncini peppers. The tomatoes I just blanched and put in quart freezer bags. Oh, and I filled another quart freezer bag with chopped bell peppers. That should bring me up to date with all of the extraneous produce...for now. Hello Pary! Could you please post Maw-Maw's sweet pickle recipe? They look yummy.